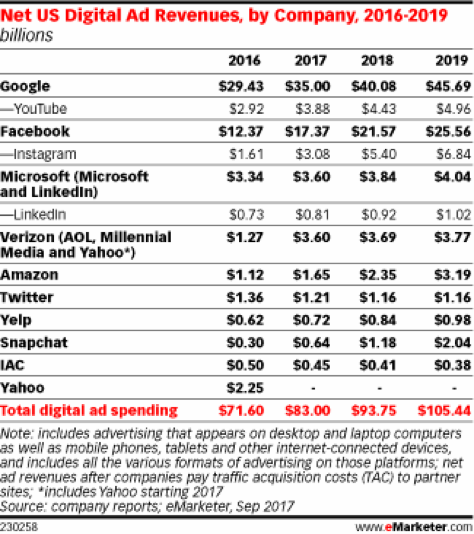 Google and Facebook will account for 63 percent of all digital ad sales this year, according to eMarketer’s latest projections shown below. This means roughly $35 billion for Google and $17.4 billion for Facebook. Yelp will make $720 million this year in digital ad sales in the U.S., while Snapchat will bring in $640 million in the U.S.
Pinterest advertisers now have access to 5,000 interest categories that will begin rolling out in the coming weeks. According to Pinterest, initial results from the super-targeted ads have increased click-through rates by 50 percent and dropped CPC by 20 percent for brands that have tested the tool (Go Nordys!). mParticle just raised $35 million in funding, bringing its cash total in recent years to $76 million. This shows the hotness of its customer-experience-minded space. Go check it out! PlaceIQ recently did a study that found 45 percent of marketers ranked online customer engagement as a key goal for their offline campaigns. Uber is suing Fetch Media for at least $40 million, accusing the mobile ad company of improper billing for fraudulent ads and falsely taking credit for app downloads. Facebook revealed last week that it turned over more than 3,000 ads that were linked to Russia and the Senate and House intelligence committees as part of its investigation centered on the 2016 presidential election.